“Exhale” was created in response to a need for an escape from our materialistic world to one where the natural world is safe from the existence of man. In this alternate reality; “Exhale” depicts organic life, protected by delicate bubbles, created from the gentle exhale of a woman. 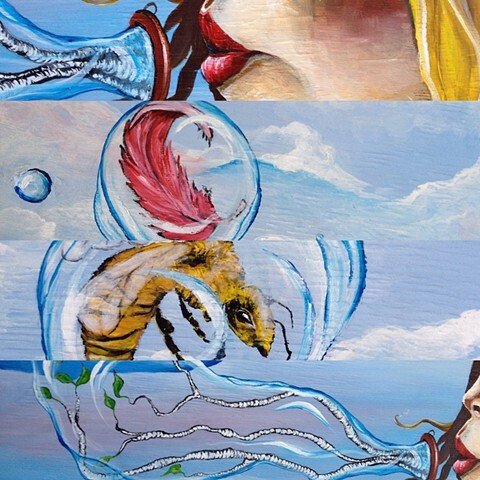 The woman in “Exhale” has created a point of departure for these natural entities through her imagined bubbles. Protected in her bubbles, these small, yet important aspects of our world, will escape to a new domain, as they drift out of this one.